My mother claims I’m hard to shop for whenever some holiday or birthday rolls around on the calendar. I love cooking, football, writing, gardening, reading, and coffee, but she insists it’s a quagmire to buy anything for me. (Cue eye roll, teenager style.) If others find themselves in similar situations, I hope you find this list helpful. May peace settle over the land of your family. No, this isn’t a secret or ulterior list for myself, but I wouldn’t throw any of these items off my front porch, either. 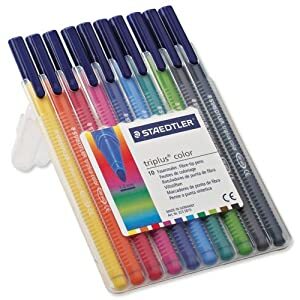 Staedtler Triplus Colored Pens, Set of 10: Hey, we’re writers, not 2-D artists, so we don’t need every color under the sun. But this set of 10 is on my desk because it helps me with plot diagrams, scene breakdowns, and heck, sometimes I just want to make notes in brown ink, yanno? They last a long time when one is not say, coloring in a homemade comic series. If you think the writer in your life needs a broader spectrum, Staedtler pens come in bigger packages of 36. The pack of 10 runs less than $20. Moleskine Passions Book Journal: Call me old-fashioned (old-fashioned!) but I still like to write down my notes on what I’ve read, even as I am a fan of Goodreads.com. And I know it makes me the whitest McWhiterson for loving the Moleskine company, but darn it, I want this notebook. It doesn’t have a bunch of lines and stupid questions about one’s reading experiences, it’s got chunky blocks of open space where I can file away what I liked and found interesting, and what I grumbled about. And I do love that elastic band clasp. $19.95. Rothco Classic Messenger Bag: There are tons of expensive cases out there, but why spend big bucks when this bag runs less than $30 online? It’s canvas, so okay, it doesn’t read sleek and luxurious. but we’re aspiring writers, right? It does the job of carrying our stuff. $17-$25 depending on style. Latest Edition of Jeff Herman’s Guide to Book Publishers, Editors, and Literary Agents: Why do I keep pulling out the old technology here? How is a 2-pound book useful to a writer in the new age of Internet information? Well, it’s everything in one place, from the obvious agent and publisher listings, to sample query letters, nonfiction book proposals, and helpful interviews with editors and other publishing industry folks. It’s a great square one reference, updated yearly. Online articles may be more recent, but they’re of varying quality and often just piecemeal. $20. Subscription to Poets & Writers magazine: There are many trade journals and magazines on the market for writers, but most are not as respected as P&W. Much of the magazine is available online, but I find a simple joy in getting something other than junk mail in my mailbox, and the pages in the back that are full of calls for stories, contests, and the like are easy to dogear for future reference. I suppose that’s called bookmarking. Ha. P&W does a great job of presenting ideas for people who’ve gone through an MFA program and those who haven’t. It may not have as much industry news as Publisher’s Weekly, but it also doesn’t cost hundreds of dollars a year to subscribe. Hey, we need that money so we can afford to go to conferences, remember? $15 for a 1-year subscription, $25 for a 2-year subscription. 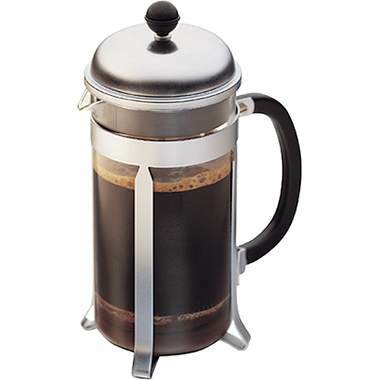 Bodum French Press: Caffeine has me in its grip and it never lets go, or so I hear. I did walk away from coffee for a while, but the 3-week-long headache was a terrible price to pay for freedom. Living in Seattle for 5 months re-addicted me, and frankly, I don’t have any time for withdrawal this time around. For the harried writer, there is no simpler, cheaper way to brew a couple of cups of joe at a time than the French press. Bodum’s is no nonsense and sturdy, and $30. You don’t even need to buy filters for the thing. Well, that’s my short list. Times are tough, but there’s no reason we need to live like Neanderthals. 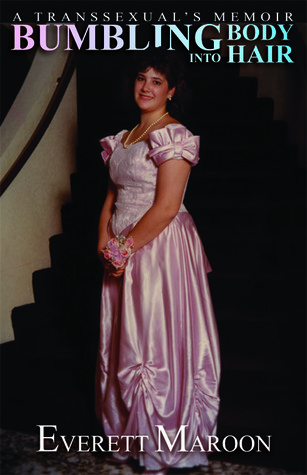 Happy writing in 2012, friends. This is a terrific post! And so spot on! I’d love the colored pens and a french press especially. And even though I have a moleskine I use, and a subscription to Writer’s Digest, you can never have too many notebooks or writer’s magazines.